When Carina was a newborn, so many of my Mom friends with babies close in age used Picky Sticky stickers for their monthly baby photos. I procrastinated and procrastinated, and never ended up buying any. Instead, I made a sign with Microsoft Word every month. Nothing fancy; just a few seasonal photos I chose from stock clip art. We'll be using either the Missy Fissy or Little Critters stickers and I am so excited about it! Which do you like best? 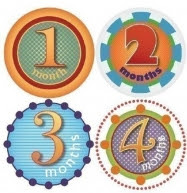 Picky Sticky is a fun way to record and share your babies growth with friends and family with baby month stickers. Stick a month sticker to a onesie or T-shirt and click a picture to share with friends and family on facebook or email. It’s an easy way to look back years from now and know exactly how old they were in photos. Picky Sticky started when our daughter was born. Each week I wrote her age on a piece of paper and then took her picture sitting next to it. As time passed I got a little more creative and dressed it up a bit with designs, using all the power Microsoft Word could muster. As she was getting older it was getting harder for her to sit still. That is when I saw some cute onesies with iron-on transfers that were pretty expensive. I didn’t know what size she was going to be at each stage and at that point the idea of using a sticker popped into my head. Thus, Picky Sticky was born. As avid fans of photography, we enjoy keeping our family history. Having a collection of photos of each milestone really put into perspective how much our babies changed and how fast time flew by. We are so glad we have these photos to remember our growing children. 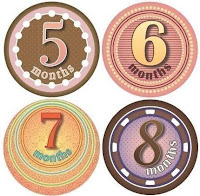 Picky Sticky has a variety styles of monthly milestone onesie stickers! Some for girls, some for boys, and adorable neutrals as well! 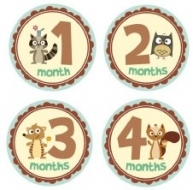 In addition to monthly stickers, there are yearly sets, a holiday pack, weekly pregnancy stickers, and a set of "babys firsts" which feature some of the most squeeworthy baby animals. Picky Sticky offers free US ground shipping on orders over $20! Picky Sticky is generously offering one of my readers a a set of stickers of their choice! This is a Rafflecopter giveaway. Click "Read More" below and then follow the instructions on the widget. Make sure to click "Enter!" after you complete each entry. All currents count! The giveaway is open worldwide and ends at 11:59 PM on Sunday, July 22nd. The first entry is mandatory - Visit Picky Sticky and leave me a comment telling me which set of stickers you'd choose if you won! Once you complete this entry, the widget will give you the option of completing the rest. Complete more steps for more chances to win!